Federal Communications Commission has authorized Convoy of Hope to form a ham radio club called the Convoy of Hope Amateur Radio Response Service (CARRS). Additional technology will assist in keeping lines of communication open to organization as natural disasters often disrupt commercial communications. For more information, e-mail USDRField@convoyofhope.org. Convoy of Hope, a disaster response organization and partner with the Assemblies of God, has embarked on a campaign to network with ham radio operators within the Fellowship as a way to improve response to crises. Because many commercial means of communication are unavailable during a natural disaster, 19 Convoy of Hope staff members have obtained a first-level technician amateur radio license, which allows for local area transmission. Several of those are working on a second-level license that would allow communication globally. The Federal Communications Commission has authorized the organization to form a ham radio club called the Convoy of Hope Amateur Radio Response Service (CARRS). 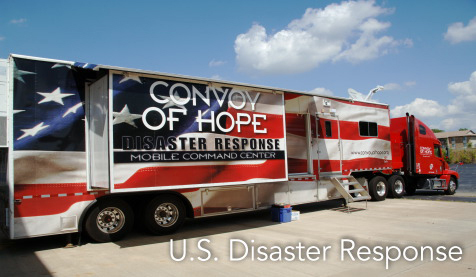 “Having this technology in place and building a network through CARRS provides a platform for us to share critical disaster response information around the world with our adherents and missionaries,” says Convoy of Hope U.S. Disaster Response Field Services Director Paul Coroleuski. Through CARRS, volunteer ham operators in the vicinity of a disaster will be able to relay initial damage assessment information that will help Convoy to better use resources as well as speed up response time. Ham radio technology today has advanced capacities that include the ability to send e-mail and upload pictures. “The initial response to this initiative has been overwhelming, and local chapters are expected to form around the nation,” Coroleuski says. There are an estimated 6 million licensed ham radio operators around the world. For more information, e-mail USDRField@convoyofhope.org.